by our friend, Dan Baker, Chief of Staff, Director of Legal Operations at Ancestry. And while this serves as a fantastic baseline for how to define legal operations, the reality is that the function is new – it is quite broad and therefore often adapted to meet the needs of a specific legal team, its departmental maturity, and the company’s overall goals and objectives. For instance, some organizations have legal operations teams primarily handling paralegal work, while others have legal ops focus solely on managing budget or the technology stack. Legal operations comes in many flavors so don’t fall into the trap of comparing yourself to others when it comes to building out your own legal ops team. Historically, only mature organizations with large legal departments could afford to bring on a dedicated legal ops function. And it was easiest for them to show the ROI with such a new role and justify headcount. This planted the seed (or in this case, the myth) that in order for legal operations to be warranted, the legal department must reach a specific size – generally VERY large. 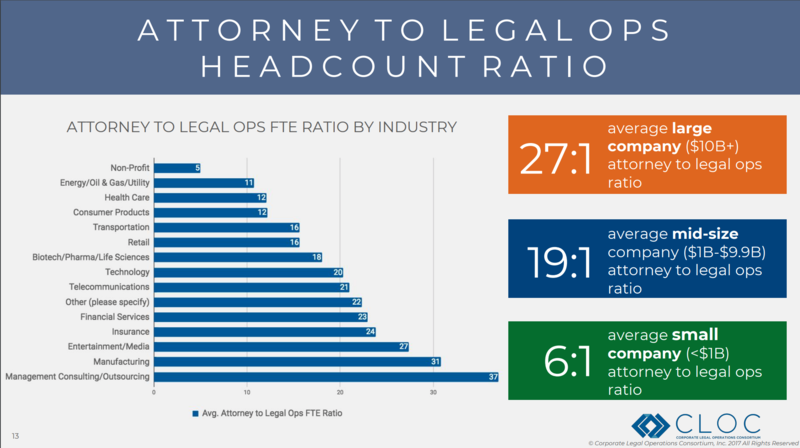 But as the 2017 CLOC Annual Survey showed, the attorney to legal operations headcount ratio varies drastically from one industry to the next. 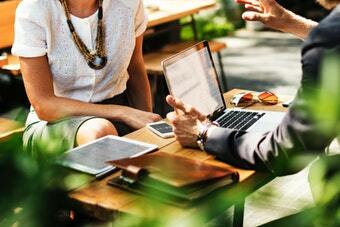 At the end of the day, there is no “legal department size guide” to follow though there are general best practices around hiring and expanding legal ops teams. We’ve also seen that a legal operations hire frequently becoming a GCs first hire. Early legal ops programs facilitate operational rigor and put critical infrastructure in place that can scale as the department grows and their scope of work increases alongside. And just because you don’t have a specific headcount for legal ops, or a full legal operations department, doesn’t mean you’re not investing in it. There’s no arguing that legal ops plays an instrumental role in ensuring efficient and accurate data collection, which can then be used to make more informed and strategic decisions that not only benefit the department, but the entire company. It is these skills that allow legal operations to drive great transformation throughout the legal department, cross-functionally with other business units, and for the entire business. Legal operations is a new and emerging field, but one that is growing and evolving at lightning speed. As a proud sponsor of CLOC four years in a row (including the institutes in London, EMEA and Australia), we’ve seen it first-hand. The outpouring of support from legal operations professionals – all with different backgrounds and experiences – to swap knowledge and tackle some of the most common legal operations challenges is inspiring. Not only is legal operations is here to stay, the community supporting shows no signs of slowing down. See You in Vegas for the 2019 CLOC Institute! We’ll be discussing what a strong legal ops team looks like, how to leverage and maximize technology, strategies for collaborating with other departments, and the future of legal tech. And don’t forget to schedule time to meet the SimpleLegal team and check out our modern and intuitive legal operations platform. It’s also the perfect opportunity to pick up your limited edition CLOC swag – we’ve got some exciting surprises in store!